Cannondale Sports Unlimited (CSU) is a cycling and sports apparel company with a passion for fun and health. Headquartered in Connecticut, CSU has a complex corporate structure with three divisions of 10+ brands that all operate differently. These brands were acquired by the parent company over several years, and they have offices around the globe. CSU was formed to get all of its brands working together better. There was lots of potential for collaboration, but employees had a hard time finding the right people to talk to. Brands had their own separate intranets, so information didn’t spread easily or widely. “We wanted to harmonize the groups together,” said Kevin Chow, Director of Application Development and Support for the performance apparel division. CSU needed a way to help staff form relationships across locations in Canada, the US, Europe, Taiwan, and Japan. It needed a single social intranet. To find the right intranet vendor, CSU brought together a few technical and communications staff. They had detailed requirements for a site that would help employees get to know each other and bring attention to the company’s activities around the world. They were also looking for a firm that matched their culture, which is young and fast-paced. Some of the candidates were just too stiff. ThoughtFarmer impressed CSU with a great product and a friendly, approachable team. After the top three vendors presented to CSU executive, a final decision was made. ThoughtFarmer would create the new social intranet for CSU. The schedule was tight, and CSU could only spare a small team to work on the project. ThoughtFarmer helped get the intranet up and running quickly. “That was pretty incredible,” said Celli, who spearheaded efforts for CSU. To collect feedback from employees, ThoughtFarmer Professional Services supplied tools that saved time. “Their online research tools were awesome: interactive, fun to use, and easy to understand. We got a great response from our employees,” said Celli. 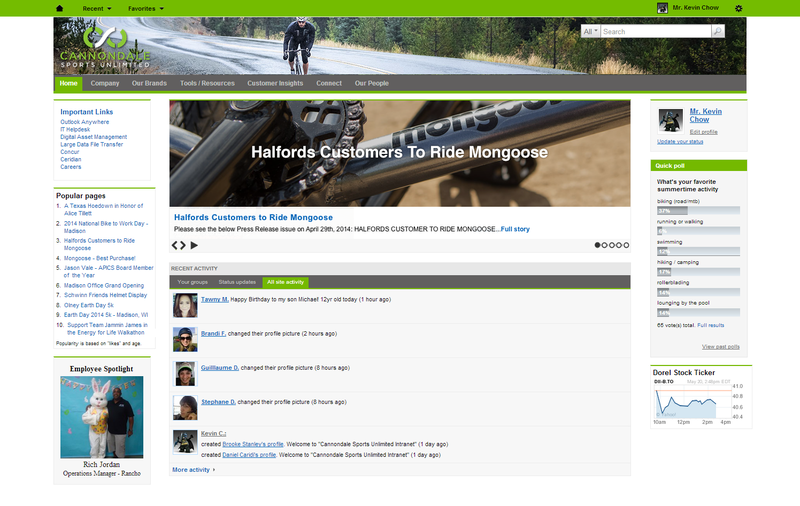 That feedback made the ThoughtFarmer intranet user-friendly and intuitive. “The biggest complaint was about figuring out who’s who,” said Chow. Organizational charts, employee profiles, and news feeds now help people find each other instead of missing out on valuable connections. Employees are now using ThoughtFarmer enthusiastically. A popular section posts customer service letters so people can read what consumers are saying. “We can understand how our brands are doing and connect with end users without having to leave the office,” said Celli. People use ThoughtFarmer to share personal status updates. Company activities like the moustache-growing efforts for a Movember fundraiser have an online home. Through the intranet, CSU discovered that an employee in France, Julien Wartel, was actually an Ironman competitor. “Our SUGOI brand is the official apparel sponsor for Ironman, and we had no idea there was an Ironman working for us!” said Chow. They were happy to send him some company gear and celebrate his accomplishments. When the head office in Connecticut had to change locations, ThoughtFarmer helped coordinate and promote the major move. Information about the new building and nearby amenities eased the transition. For CSU, a company with an international distributed workforce, ThoughtFarmer has narrowed the gaps between people and helped create a stronger team.